For those that took the time to view all the links provided in the text, you would have noticed that a couple of those projects were based here at The Ohio State University. Within the US Grains Council report, one summary in particular from Morrow et al. (2013) reviewed the concerns of sulfur content and acidity level of DDGS. During ethanol production, sulfuric acid is used to adjust water pH and to clean the processing system. As a result, varying levels of sulfur can be found in DDGS and thus become a concern to livestock producers as high levels of sulfur could result in decreased ruminal pH, decreased dry matter intake (DMI), and if severe enough polioencephalomalacia (PEM – a neurological disorder). Therefore, in order to reduce the level of diet acidity and the potential for production inefficiencies, Morrow et al. (2013) investigated the use of including caustic soda (sodium hydroxide – NaOH) to the diet. A series of two experiments were conducted to test this work. Experiment 1 focused on feeding pre-weaned lambs which included 60 ewes and 12 wether lambs that were fed four different diets on a dry matter basis; 1) 60% DDGS + 0% Na2SO4, 2) 60% DDGS + 0.88% Na2SO4, 3) 62% NaOH-treated DDGS + 0% Na2SO4, and 4) 62% NaOH-treated DDGS + 0.88% Na2SO4. In addition to the ingredients listed above, the remainder of the diet consisted of ground corn, soyhulls, minerals, and vitamins. It should be noted that 0.88% of Na2SO4 was added to two of the diets in order for there to be a 0.2% difference in dietary sulfur between treatments without affecting diet acidity. Experiment 2 focused on feeding feedlot lambs which included 32 lambs that were fed four similar diets as listed above at different ratios; 1) 45% DDGS + 0% Na2SO4, 2) 45% DDGS + 0.88% Na2SO4, 3) 47% NaOH-treated DDGS + 0% Na2SO4, and 4) 47% NaOH-treated DDGS + 0.88% Na2SO4. 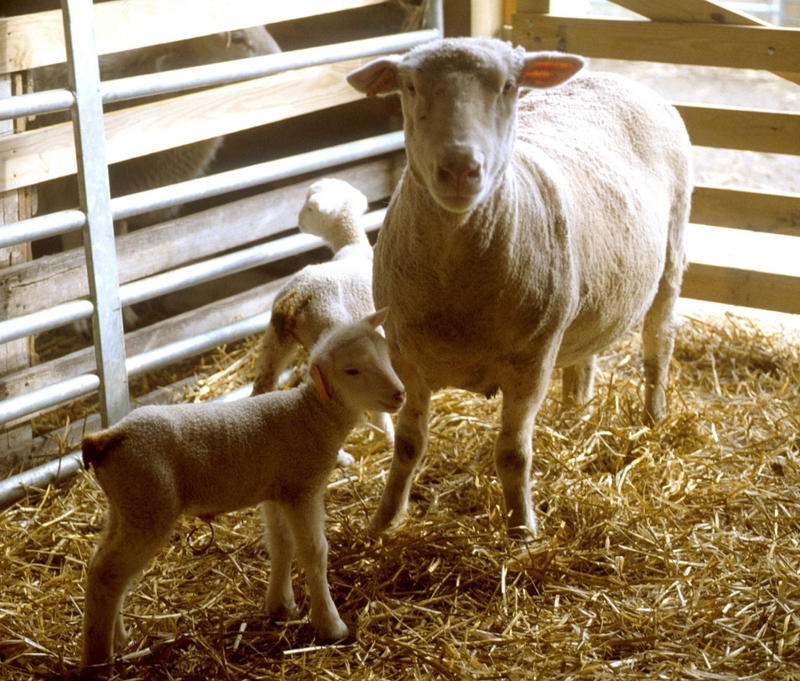 As you will note, in Experiment 2 DDGS levels were decreased as compared to the diets in Experiment 1 due to six lambs being euthanized as a result of developing symptoms of PEM due to high levels of sulfur in the diet. In Experiment 1, lamb performance and rumen sulfur concentration were evaluated. Results for Experiment 1 showed that lambs fed DDGS treated with 2% NaOH tended to have a greater average daily gain (ADG) when compared to lambs fed untreated DDGS (0.73 lbs. vs. 0.66 lbs.). As a result, lambs fed DDGS treated with 2% NaOH demonstrated a 4% increase in final body weight (BW) when compared to lambs fed untreated DDGS (97.9 lbs. vs. 93.9 lbs.). In addition, lambs fed DDGS treated with 2% NaOH tended to have a greater (DMI) when compared to lambs fed untreated DDGS (2.75 lbs./d vs. 2.55 lbs./d). On the other hand, increasing dietary sulfur via Na2SO4 tended to reduce DMI when compared to lambs not receiving additional sulfur in their diet (2.55 lbs./d vs. 2.75 lbs./d). However, adding additional sulfur to the diet did not affect lamb ADG, gain:feed (G:F) ratio, or final BW. Rumen sulfur concentration was not affected by sulfur or NaOH dietary treatments. For Experiment 2, lamb performance and diet digestibility was recorded. Results for Experiment 2 showed that treating DDGS with 2% NaOH tended to increase ADG and DMI when compared to lambs fed untreated DDGS diets. However, lambs fed DDGS treated with 2% NaOH demonstrated a decrease in Neutral Detergent Fiber (NDF) digestibility, up to 10%, when compared to lambs fed untreated DDGS. Overall, these studies showed that treating DDGS with 2% NaOH was an effective way to neutralize the acidity in DDGS diets. As demonstrated in Experiment 1, feeding DDGS diets treated with 2% NaOH resulted in a heavier final body weight of pre-weaned lambs. In addition, feeding DDGS diets treated with 2% NaOH also had greater ADG and DMI when compared to lambs fed untreated DDGS diets in both Experiment 1 and 2. However, treating DDGS with 2% NaOH decreased NDF digestibility. 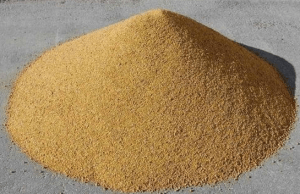 NDF digestibility is an indicator of the digestibility of forages in the diet. The addition of NaOH in the diet resulted in a decrease in forage digestibility and utilization. Furthermore, feeding diets that contained greater than 0.6% sulfur in the diet put lambs at a greater risk of developing PEM. In conclusion, DDGS are a realistic and viable feedstuff for to small ruminants. However, as with any livestock, when feeding be sure to test DDGS regularly to ensure that you are keeping sulfur levels low to avoid any potential issues associated with sulfur toxicity. Morrow, L. A., T. L. Felix, F. L. Fluharty, K. M. Daniels, and S. C. Loerch. 2013. Effects of sulfur and acidity on performance and digestibility in feedlot lambs fed dried distillers grains with solubles. J. Anim. Sci. 91: 2211-2218. Posted by Braden Campbell at 8:00am March 7, 2019 Posted in Nutrition, Research and tagged Management, Nutrition, Research. Bookmark the permalink.